Evening begins on time – half past seven, in crowded Glasgow Royal Concert Hall. When the lights are down, in the small spotlight appears women with the guitar – Anne Marie Helder. She is British singer-songwriter, who usually participates in various projects. Now she is on the stage alone. Her show starts with song about dominos, this and following ones are purely acoustic. 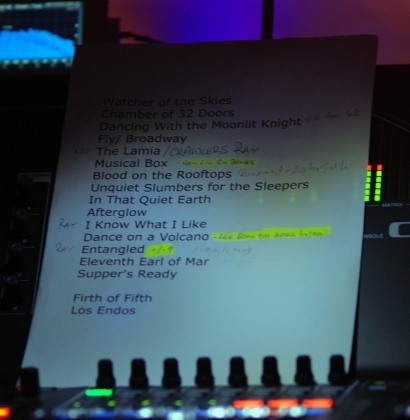 Not much – 4 or 5 songs and the show is over after 30 minutes. So that was an opening act for Steve Hackett, who, as it seems, is prepared quite a show for the evening. It looks like everything is going as it was planned: on time, in order and in good mood. That is the impression made for many of visitors. As the Glasgow Royal Concert Hall webpage states, it is the first time, as any original former member of Genesis has toured the band's repertoire from 1971-1977 period. And that was already promising. The line up on the stage was interesting, too. 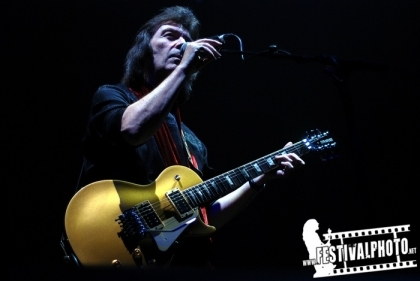 Besides Steve Hackett himself, there were quite a plenty of his mates: Lee Pomeroy (was playing in Take That) as the bassist, Nad Sylvan as main vocalist, Ray Wilson as guest vocalist and few more. The show starts with the beautiful intro and lights on the keyboardist and „Watcher of the Skies“. Not so long after that – the famous „Dancing With the Moonlit Knight“, „The Lamia“, „Musical Box“, „Dance on a Volcano“. As Steve Hackett said: „you know songs better than we do“. So people were singing and waving, and screaming, and clapping... a lot of noise for a such a venue with seated places only. It looks like the whole show was very carefully prepared – the sound, intensive and really artistic lights and video installations, although the were some small difficulties, which were solved in few minutes. Members themselves were in a good mood and creative on stage – there were quite many moments, when it was possible to see them smiling to audience or to each other. Or.. at some moment you just find out yourself looking how Steve is cleaning shoes to other members on the stage, while they are still playing. The show ended with two songs for the encore. In the end I must admit, that this is must see event for every Genesis fan.